The visual software development capabilities enable you to develop embedded software using UML diagrams or a traditional code editor to generate code. You can import existing code into the modeling environment for further development. IBM Engineering Systems Design Rhapsody - Architect for Software helps maintain consistency of architecture, design, code and documentation automatically. You can move from design to implementation with near real-time, automated, embedded software engineering. 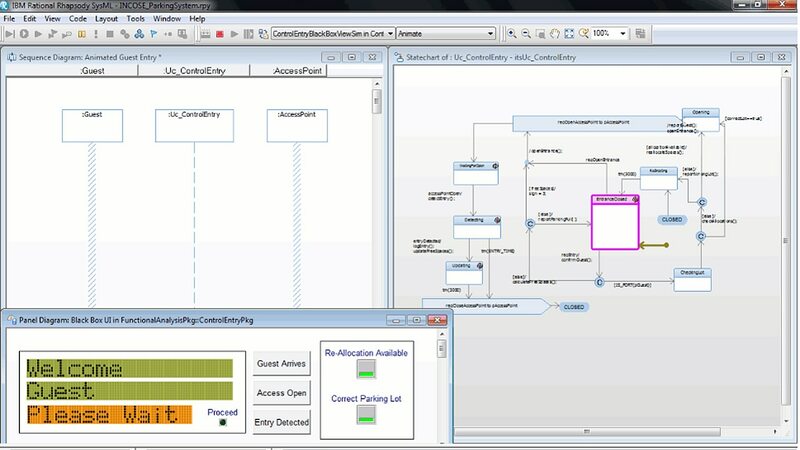 Systems Design Rhapsody - Architect for Software generates C, C++, Java and C# code frames to engineer the structure and architecture of your design. Using code frames, you can add detailed coding to either a model or the code. The IBM ELM application synchronizes the changes for consistent data. The MARTE profile helps you model near real-time performance and analyze design bottlenecks. Collaborate with team members using model-based differencing (AUTOSAR & DDS) and merging features including integration with IBM Engineering Workflow Management. Use Design Manager to share and review designs and trace to lifecycle artifacts using OSLC. The software integrates with Workflow Management and other IDEs based on the Eclipse platform. Models developed in IBM Engineering Systems Design Rhapsody- Architect for Software can be imported to Rhapsody Developer editions for design testing. This software provides requirements traceability from the design back to the requirements to comply with standards such as DO-178B, ISO-26262 or IEC 61508. You can insert requirements information into the code to assist traceability in the final implementation. It provides a parametric constraint solver for SysML parametric diagrams and facilitates trade study analysis and architectural trade-offs. It also provides static model checking analysis to improve model consistency and completeness. Systems Design Rhapsody - Architect for Software provides lifecycle support and add-on software, allowing you to integrate with other IBM ELM products for full product lifecycle development. For example, IBM Engineering Systems Design Rhapsody - Tools and Utilities Add On software provides customizable, template-based documentation. IBM Engineering Lifecycle Optimization - Publishing automates the generation of document-style reports across your deployed IBM Jazz™ and third-party tools.